[map] [street view] East of Memorial Parkway NW on the northern side of Hollywood Boulevard SW. Co-located with WZNS. 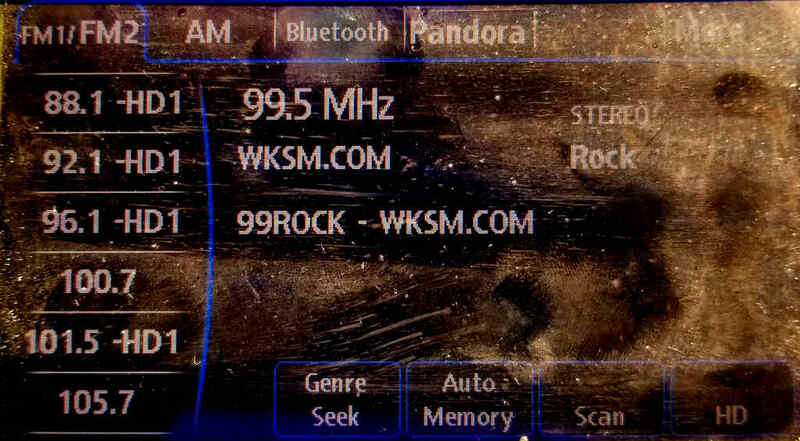 [Image] Picture of the station's RDS data as displayed on a Mazda OEM car stereo. From June 2018. This station debuted in 1965, as the companion FM to Vacationland Broadcasting's 1260 WFTW. Originally, it was a 3 kW Class A on 99.3 MHz and simulcast with the AM 100%. It's not known what the format was of the two stations early on, but by about 1974, they were listed in the Broadcasting Yearbook as doing a Middle of the Road (MOR) format, with songs from the 40's through the 70's. The stations added some talk and call-in programming in the mid to late 70's as well. In the early 80's it split from the AM to go Adult Contemporary, and received a permit to relocate to the 96.5 MHz frequency, with 100 kW from a site near Crestview. If built it would have covered a lot of Panhandle territory, but due to some FCC issues it never came to pass. From 1988 or 1989 through much of the early 90's, the station was a Contemporary Hit Radio (CHR) music station, and took on the WKSM (KisS) calls to compliment the new format. In the mid-90's, the station was granted a permit to increase power to 50 kW on their current dial position of 99.5 MHz; it went on the air in 1996. With the dial change, the format changed as well, to the current rock format. The CHR music format wouldn't return to the market until WZNS debuted on the aforementioned 96.5 MHz allocation in 1997.